For important information on how you can support your favorite food bloggers, please click here. You know, some people think that four leaf clovers are hard to find but when I was a little girl my mother could always walk right up to a clover patch, look down for a few seconds, and pluck one right up. It seemed she had a special gift for finding clovers, and as I grew older I came to realize she had a special gift for finding a lot of good things. In the middle of the worst storm, Mama could find a song to sing. When we came home with a bad hair cut, Mama could point out the one thing that made it just perfect and turn everyone’s opinion right around. When our school friends went away on trips we could never afford, Mama would invite all the neighborhood kids over to play in our back yard and fill our days with homemade popsicles and hosepipe tag. She could find good in any situation as easily as looking down at a patch of hundreds of clovers and plucking out the one with four leaves on it. I spent my childhood looking to her as my example and this morning, I got to thinking about those clovers and how much better I am at finding them now that I’m older. Now, when I walk outside and come back in with a handful of four leaf clovers my daughter exclaims with delight that I must be really good at finding them! I just smile and tell her that they’re there for anyone who looks. Like the special little moments in life, pockets of happiness, and reasons to be grateful. 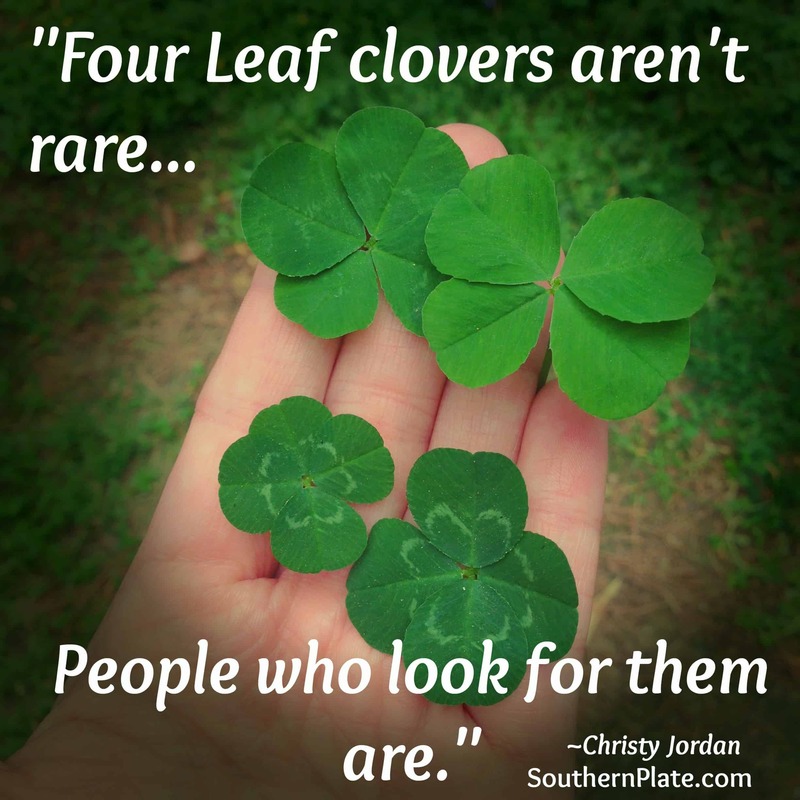 Four leaf clovers aren’t rare. The people who take time to look for them are. Alrighty, time to package my heart back up and get on to the cooking! If you’ve never had this soup, you’re in for a treat and a half. 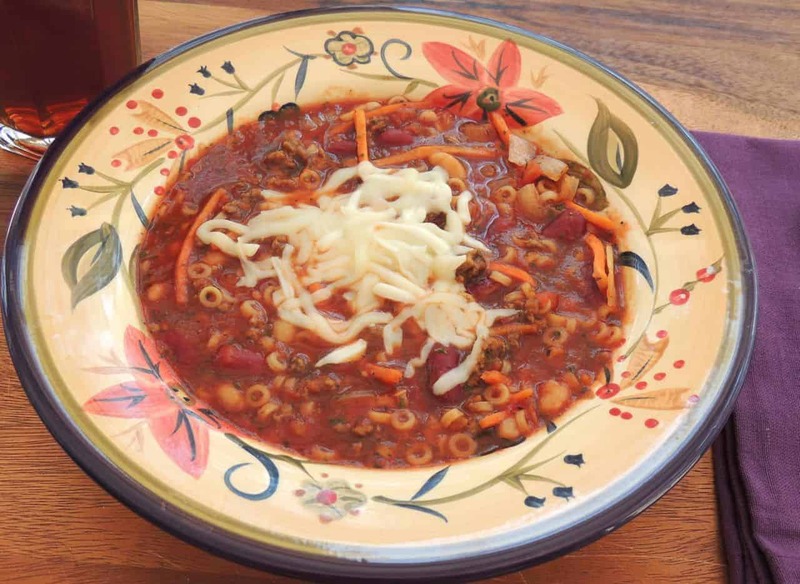 It’s kind of like an Italian version of chili – and my family LOVES it! There are all sorts of variations of Pasta Fagoli out there. Translated from Italian, it simply means “Pasta and Beans” and is traditionally an economical meatless dish. I like to add meat to mine but you can certainly leave it out. I was originally inspired to make it due to my favorite soup, salad, and breadsticks treat at the local Olive Garden. This is not the exact recipe Olive Garden uses, of course, but it is close. This is also not the exact recipe found around the web, but it’s close enough to those, too. My recipe is a little more streamlined and makes about half as much as the other recipes do. My recipe makes about 4 quarts, which is a reasonable amount for a family. Leftovers reheat and even freeze really well, too. You’ll need: Kidney Beans, Navy Beans, Beef Broth, Crushed Tomatoes, Tomato Sauce, Matchstick carrots (or carrots you cut yourself), diced onions, small ring pasta (or small pasta of your choice), and browned ground beef. Note: I was tired the day I made this and decided to cook up some ground beef. As soon as I got it into the skillet I went and sat down to gift myself with a little time reading my latest Tamera Alexander novel…a while later I remembered my ground beef. Needless to say, it was a little overcooked but the beauty was that I was browning it for this recipe and since this is a slow cooked soup, that gives the overly cooked ground beef time to soften up a bit. Crisis averted. You know, really, most crises can be averted if we just refuse to let them become crisis in the first place, don’t you think? You’re gonna need some seasonings, too. I’m using salt, dried parsley, and dried Italian seasoning. 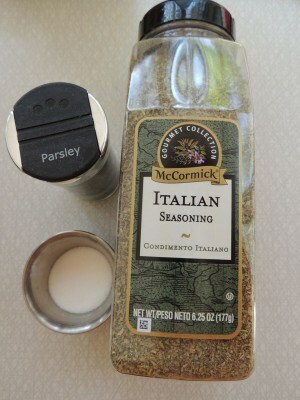 Now if you’ve been with me a long time you may be thinking “Christy sure does use Italian seasoning a lot!”. If you’re thinking that, you’re right. For me, it is the ketchup of dried herb blends! Having said that, if you would prefer to make it a little more complicated, feel free to come up with your own herb blend. I’m sure it will be great – or just give yourself a break and do it my way. It’s not like you don’t work hard enough as it is. So basically, you dump everything in a slow cooker except for your pasta. I drained my beans but it’ll be just fine if you’d rather not. Dump, dump, dump, dump, then…. Now put the lid on it and let it cook on low for 7-8 hours or on high for 3-4 hours. About half an hour before serving, stir in your pasta and put the lid back on so it can get done. Top it with fresh grated parmesan if you want or just go my route and use some mozzarella. There is no rule that says you can’t use whatever cheese your heart desires – and if you find that rule written somewhere, just go ahead and break it. Oh look, our soup is done! If there are any leftovers, they refrigerate and even freeze well. I thought I’d have leftovers from this but after teenage son ate two bowls and husband ate three…then I myself came back for another bowl…it disappeared pretty fast. 1 cup dried pasta I'm using little rings. Place everything but the pasta into a 5-6 quart slow cooker and stir to combine. Cover with lid and cook on low, 7-8 hours or high, 3-4 hours. Thirty minutes before serving, stir in pasta and cover again until pasta is done (about 20 minutes). Serve topped with shredded cheese if you like. To make on stove top, combine all ingredients except for pasta. Bring to a boil over medium high heat, stirring often. 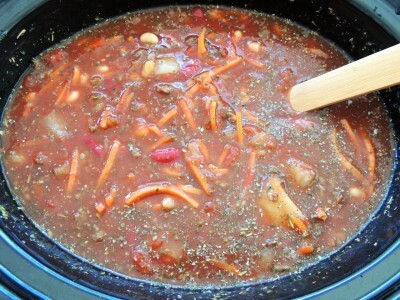 Reduce heat and simmer, uncovered, 30 minutes, stirring from time to time. Add pasta and continue to cook for 15 minutes more, or until pasta is done. How many does it serve? Well that depends. If you are a hungry NFL football player, this serves one. If you are a 90 pound woman who eats like bird, this serves 20-25. If you are a family of five who loves a good hearty soup, this will serve about 5. Serving amount is terribly relative and always a best guess either way you go so just grab a bowl and dig in! There are four things you cannot recover: The Stone—after the throw, The Word–after it’s said, The Occasion–after the loss, The Time–after it’s gone. Here’s a fun new page to like on Facebook! 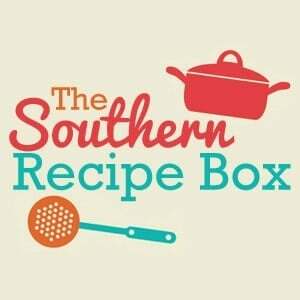 The Southern Recipe Box is a place where YOU can go and share LINKS to your favorite Southern recipes. Lots of yumminess has already been posted and we’d love for YOU to join in – Help us discover the best food blogs around the web – and we’ll help you discover what to cook for supper! Click here to Like The Southern Recipe Box on Facebook. Win a $100 Gift Card to the Famous Highlands Bar and Grill & A Chance to Go To the James Beard Awards in NYC! Money Saving Tip: Go Bananas! My husband just asked ‘what’s for dinner?’ at 10:15a.m. I’m pulling the crockpot out right now! I think i’m going to try this but use turkey or chicken and chicken broth instead of the beef. We’ve been trying to cut out beef and pork. Ehhh… I’m soo sick of turkey and chicken!!! Love that beef and PORK, remember, Pork, is the OTHER WHITE MEAT! Hahahahaha! This is funny to me…my Italian grandmother & great grandmother often made this, but the thing is, in Italian families, pasta e fagioli is a MEATLESS dish…no meat at all, neither chicken or turkey, beef nor pork. It is about the cheapest, healthiest thing there is, and you can certainly eat it with a sandwich that has meat in it…but no, I never heard of anyone putting meat in it until the Olive Garden Restaurants opened. BTW Christy, love this site & all the wonderful recipes you have on here! I’ve made quite a few!!! Christy, I have been searching for someone else to read. Could you recommend any of Tamera Alexander’s books for me? I am not familiar with her! And I can’t wait to try this recipe! I will try it with the Quinoa/corn pasta I usually use in your Country Casserole recipe! Your story reminds me of the movie “Pollyanna” with Hayley Mills! I love that movie to this day! “You can always find the good in everything if you just look! 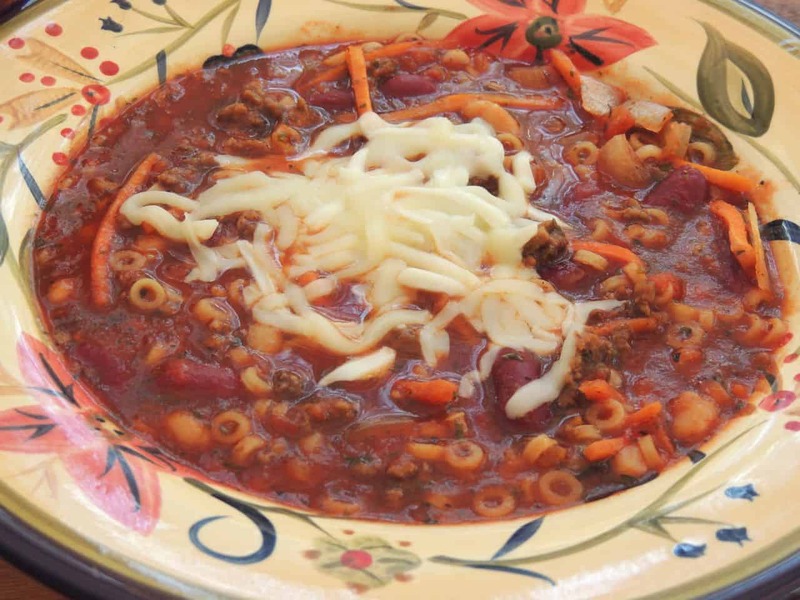 Since we’re chili and spaghetti fans around here, this recipe is right up our alley and down our street. The name first name that came to mind for your gang was, Christy’s Southern Sisters, but that doesn’t sound like a name that would include our Southern Plate brothers!! I’m sure others will come up with some great suggestions, though! Will be giving this soup a try VERY soon!! This is so funny! My son is sick (not funny) and I was asking him what type of soup he wanted. He said this Pasta Fagoli! And this was waiting in my email! Thanks you so much! He will be happy and hopefully felling a little better with this soup. it my own. It’s the best chili I’ve ever had! Oh well, I can dream………..
clover. As a kid, I’d get kinda irritated cause I could look forever and not find one! Wait… Brady is a teenager?? Worse than that, he’s almost 14! Where did the time go? Oh my goodness Christy… no joke. Time does slip away. My daughter turned 30 this past March and being that I’m only 30 (batting eyes so innocently) I just can’t imagine how that can be! This soup looks wonderful. I am filing it away for a day when we slip under 90 degrees again. Thanks!! 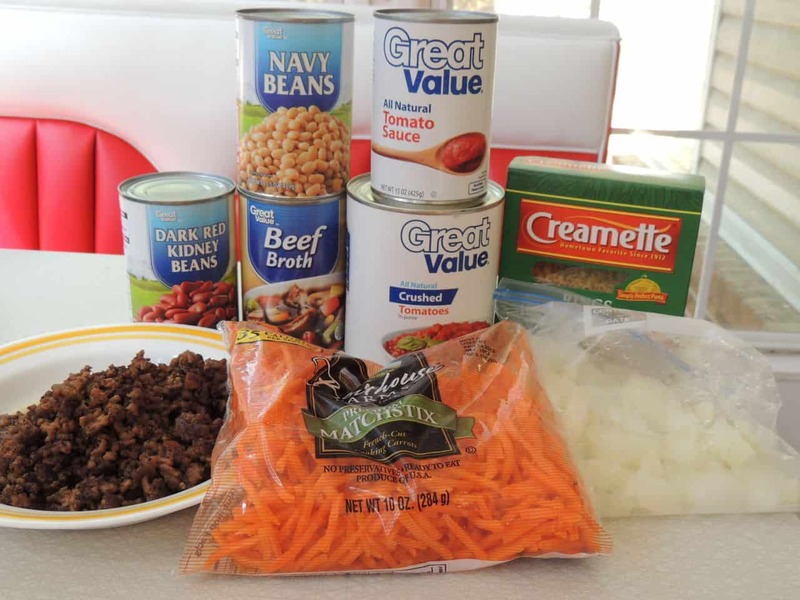 I have made this in a much more complicated version and have left out the meat, since it has so many beans in it as protein, I like that yours looks much simplier but just as yummy, since we have “meatless” once a week, sounds like this one needs to be tried out next week, thanks for the recipe. 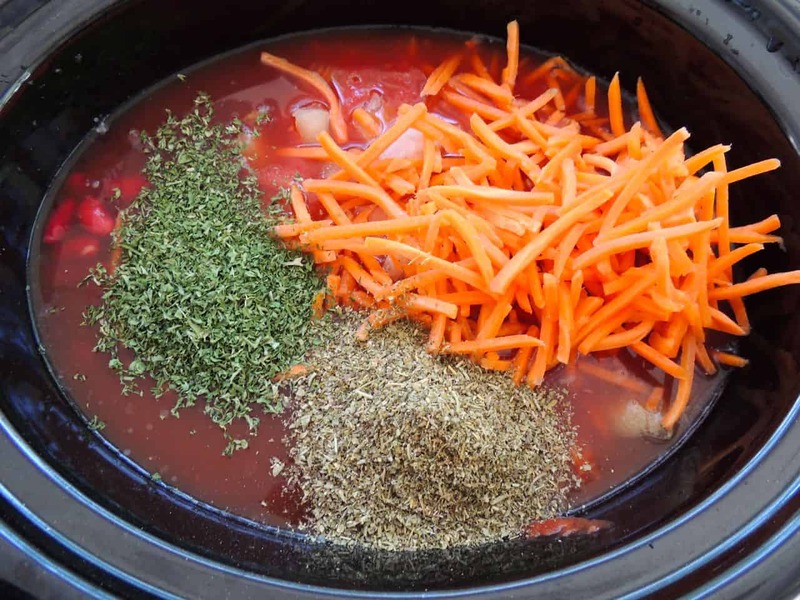 Hey Christy – We love this soup too!! FYI – the white beans are cannellini (not cannoli, which is a dessert) – LOL!! Sometimes we use a jar of (or homemade) spaghetti sauce and a small can of diced or crushed tomatoes – just depends what is on hand. Anyway a wonderful soup!!! LOVE your blog site!!! Christy, thank you for this recipe. It is raining here today so will not be doing some of the things on the ranch that need to get done but aren’t pressing. We are about finished with the spring calving now. I will be making this recipe for the weekend and keeping it warm in the slow cooker/crockpot for a quick lunch. I made some pickled onions a couple days ago and I like vinegary foods so I will top this recipe with some pickled onions with or without the cheese topping. I also may ad a little bit of vinegar to the Fagoli as it is cooking. Thanks again. This is a perfect way to transform some tired, ol’ homemade chili. I was just wondering what to do to pep it up. Thank you, Christy! I am gonna try this as soon as I can! It sounds great, and as usual, your post prior to the recipe lifted my spirits today. I really needed that since I have been stranded in an airport for 3 hours and so badly wanting to make it home today! Been on a two week business trip! Would be perfect for today but my husband wants pizza on Friday soooooooooooooo tomorrow, tomorrow!!!! lol Thanks so much for the recipe. I always order this at Olive Garden! Now I will fix it at home. my suggested name for the bike gang is “Christy’s Cruisers”. We have a soup lunch after church once a month and this is what I’ll be fixing for the next one!! Love it at Olive Garden but the closest one is 80 miles away so I don’t get it very often any more…but thanks to you, I’ll get to have it any time I want!! Now to find some small, whole grain pasta!! I would like to have one of the old timey bikes. You know, the kind you can sit up straight and ride, without leaning over! Can’t wait ti try this soup. I also wanted to let you know that I copied the picture and script of the four-leaf clovers and shared them on my Facebook page – hope you don’t mind. I LOVE Tamera Alexander, also Tasha Alexander. Have you tried hers? 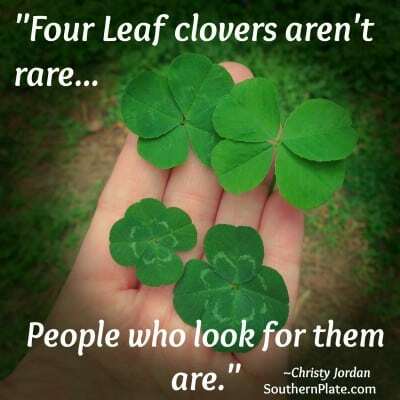 My Mom was exactly the same way with finding four leaf clovers. Us (9) kids rarely found them but it was a common thing for my Mom. She passed away in February of 2011. The grass didn’t grow very good at her gravesite the first year but last year it was almost completely covered with clover. Couldn’t help but make me smile. I’m sure there was a few four leaf clovers hiding in there. My husband passed away seven months after my Mom and can’t tell you how many times your newsletter with your writings has blessed me and made me feel a little better. My husband loves the pasta fagioli from that “place”, it’s the only reason we go there. We prefer to get our Italian food at a local Italian place. I can’t wait to make this for him. I cooked a very similar recipe for our family soup get together this winter and it was the favorite! Thank you Christy for another great recipe that I am going to try this week. Where did you buy the Creamette rings? I live in AL too and have never been able to find them here. When my Mom comes to visit from MN she usually brings me a couple boxes. Looking forward to your next email.